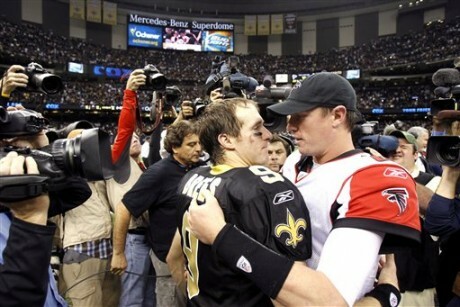 Falcons Calling For Playoff Rematch With New Orleans? 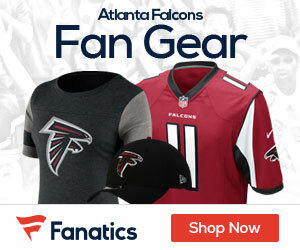 Shortly after their stunning loss Monday night, some of the Falcons were calling for a rematch with the New Orleans Saints, according to D. Orlando Ledbetter of the Atlanta Journal-Constitution. After losing 45-16 and watching the Saints run up the score late to help Drew Brees break a long-standing NFL record, it might not seem like a good idea to ask for a rematch. The Falcons have been eliminated in their opening playoff game after the 2008 and 2010 seasons. The Falcons tried to downplay the Saints’ running up the score late to get Brees the record. But you can bet that it will come up if the two teams meet again in the wild-card round of the playoffs. Although they said nice things about Brees after the game, you could see the disgust in the coaches’ faces as the Saints were marching in for the late score. Falcons coach Mike Smith was asked twice about the Saints running up the score, but he didn’t pass judgment on Saints coach Sean Payton’s tactics. Up 38-16 with 5:08 to play, the Saints ran six plays and threw five passes, including a 9-yard touchdown pass to running back Darren Sproles to break the record. A Mardi Gras-style celebration ensued.